Raleigh County is a county in the U.S. state of West Virginia. As of the 2010 United States Census, the population was 78,859. Its county seat is Beckley. 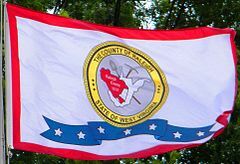 The county was founded in 1850 and is named for Sir Walter Raleigh. 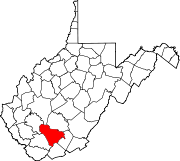 Raleigh County is included in the Beckley, West Virginia Metropolitan Statistical Area. Raleigh County was formed on January 23, 1850 from portions of Fayette County, then a part of Virginia. Alfred Beckley (1802–88) said that he named the county for Sir Walter Raleigh (1552–1618), the "enterprising and far-seeing patron of the earliest attempts to colonize our old Mother State of Virginia". The county was the scene in 1914 of the Eccles Mine Disaster, the second-worst coal mining disaster in West Virginia history. The death toll was at least 180. More recently, the Upper Big Branch Mine disaster of 2010, which killed 29, also occurred in Raleigh County. Longtime Senator Robert Byrd's home town was Sophia. The New River flows northwestward along the county's east border. The county terrain consists of wooded hills, carved with drainages. The terrain slopes to the north and west; its highest point is near its southmost corner, at 3,524' (1074m) ASL. The county has a total area of 609 square miles (1,580 km2), of which 605 square miles (1,570 km2) is land and 4.0 square miles (10 km2) (0.7%) is water. As of the 2000 United States Census, there were 79,220 people, 31,793 households, and 22,096 families in the county. The population density was 131/sqmi (50.6/km²). There were 35,678 housing units at an average density of 59/sqmi (22.8/km²). The racial makeup of the county was 89.63% White, 8.52% Black or African American, 0.19% Native American, 0.72% Asian, 0.02% Pacific Islander, 0.12% from other races, and 0.80% from two or more races. 0.92% of the population were Hispanic or Latino of any race. This number is around 0.3% based on a 2006 Census Estimate by the US Census Bureau. There were 31,793 households out of which 28.60% had children under the age of 18 living with them, 54.30% were married couples living together, 11.90% had a female householder with no husband present, and 30.50% were non-families. 27.10% of all households were made up of individuals and 12.90% had someone living alone who was 65 years of age or older. The average household size was 2.38 and the average family size was 2.88. The county population contained 21.50% under the age of 18, 8.70% from 18 to 24, 28.60% from 25 to 44, 25.70% from 45 to 64, and 15.40% who were 65 years of age or older. The median age was 40 years. For every 100 females there were 96.80 males. For every 100 females age 18 and over, there were 94.90 males. The median income for a household in the county was $28,181, and the median income for a family was $35,315. Males had a median income of $33,000 versus $20,672 for females. The per capita income for the county was $16,233. About 14.60% of families and 18.50% of the population were below the poverty line, including 28.70% of those under age 18 and 10.50% of those age 65 or over. As of the 2010 United States Census, there were 78,859 people, 31,831 households, and 21,322 families in the county. The population density was 130/sqmi (50.3/km²). There were 35,931 housing units at an average density of 59.4/sqmi (22.9/km²). The racial makeup of the county was 88.5% white, 8.2% black or African American, 0.9% Asian, 0.2% American Indian, 0.4% from other races, and 1.7% from two or more races. Those of Hispanic or Latino origin made up 1.3% of the population. In terms of ancestry, 41.8% were American, 9.1% were English, 8.6% were German, and 8.5% were Irish. Of the 31,831 households, 29.0% had children under the age of 18 living with them, 50.2% were married couples living together, 12.2% had a female householder with no husband present, 33.0% were non-families, and 28.6% of all households were made up of individuals. The average household size was 2.36 and the average family size was 2.87. The median age was 41.1 years. The median income for a household in the county was $38,036 and the median income for a family was $49,837. Males had a median income of $42,405 versus $27,347 for females. The per capita income for the county was $20,457. About 14.5% of families and 17.5% of the population were below the poverty line, including 26.1% of those under age 18 and 10.2% of those age 65 or over. Raleigh County voters have tended to vote Republican in recent decades. In 67% of national elections since 1980, the county selected the Republican Party candidate (as of 2016). ^ a b "State & County QuickFacts". United States Census Bureau. Retrieved January 11, 2014. ^ "2010 Census Gazetteer Files". US Census Bureau. August 22, 2012. Retrieved July 30, 2015. ^ "Population and Housing Unit Estimates". Retrieved March 20, 2019. ^ "US Decennial Census". US Census Bureau. Retrieved January 11, 2014. ^ "Historical Census Browser". University of Virginia Library. Retrieved January 11, 2014. ^ "Population of Counties by Decennial Census: 1900 to 1990". US Census Bureau. Retrieved January 11, 2014. ^ "Census 2000 PHC-T-4. Ranking Tables for Counties: 1990 and 2000" (PDF). US Census Bureau. Retrieved January 11, 2014. ^ Leip, David. "Atlas of US Presidential Elections". uselectionatlas.org. Retrieved March 28, 2018. Wikisource has the text of an 1879 American Cyclopædia article about Raleigh County, West Virginia.